Did you recently make the switch from a Design Suite to an Industry Collection (like the AEC Collection) subscription but don’t have access to the new software because your contract hasn’t flipped yet? Although Autodesk allows clients to renew early and take advantage of current promotions, your contract date remains the same. Autodesk determines the software you have access to from your contract date – not the date you chose to renew and possibly switch to an Industry Collection. This policy means many CADD Microsystems clients have found themselves waiting a month or so to gain access to their new AEC Collection subscription in Autodesk Account. Many clients begin planning to deploy their new software from the moment they choose to switch to a subscription. Since access to your new software isn’t granted until your contract date, that’s left many clients asking our team if there’s an alternate way to download the software? 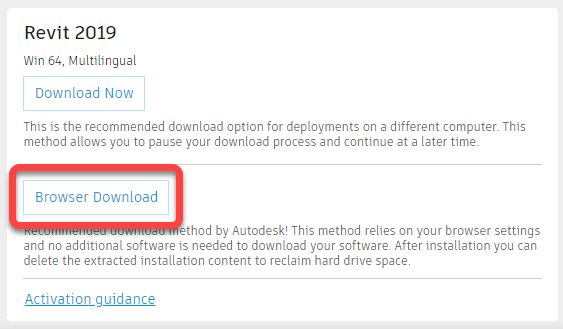 While you anticipate the arrival of your new software subscription, you can begin downloading it today through the Autodesk Virtual Agent (AVA). This is helpful if you want to begin creating deployments in advance of your contract date. Choose Download Autodesk Products. 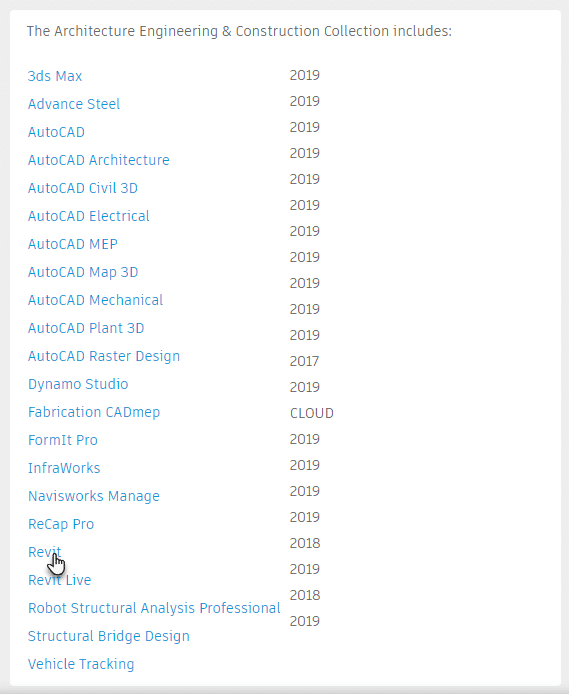 Alternatively, you can enter “Download Revit 2019” to go directly to the download for a specific software title. Click Browse when asked What product and release year are you looking for? 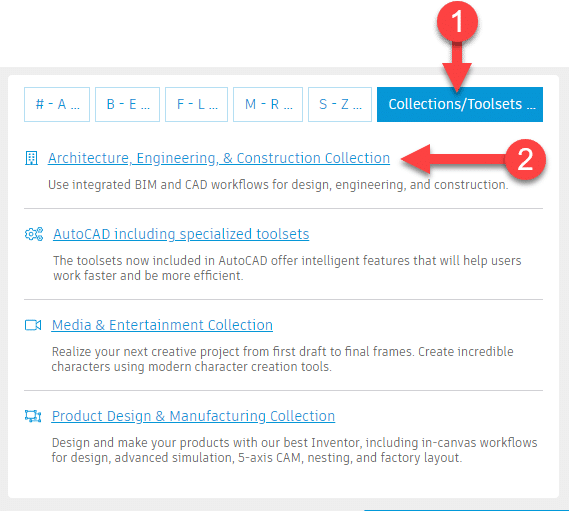 Choose the software title you would like to download when asked to “Select the product you would like to access.” If downloading software from the AEC Collection or AutoCAD Toolset, choose Collections/Toolsets, and then the Collection or Toolset you wish to download. AVA displays a list of software included in the selected Collection or AutoCAD Toolset. Choose the software application you would like to download. Note: Software included in Collections/AutoCAD Toolsets is installed individually. Therefore, multiple downloads and deployments are necessary to deploy multiple applications from a Collection/AutoCAD Toolset. Choose your preferred download method. For building deployments, our team recommends Browser Download. The above method will download a self-extracting ZIP file in the downloads directory on your computer. It’s important to note, some software applications include multiple download parts. When all parts of a selected software application are downloaded, double-click the first part (ZIP file) to begin unpacking the installer. Choosing Browser Download will download a ZIP file to the Downloads directory on your computer. Double-click the (first) ZIP file once complete to extract its contents. By default, the contents of the ZIP file will unzip a full installer to c:/Autodesk (or the location of your choosing). You can use these installers to create your deployments ahead of time. If you have additional questions, please reach out to us here and someone from our team will contact you shortly. Jessica has worked in the AEC industry for 17+ years. Her industry experience and knowledge makes her a valuable resource to her customers. Jessica is customer-centric and enjoys connecting like-minded companies. If she is not at work you can find her at CrossFit, or relaxing on her porch with her family. Autodesk is now providing a cost-effective way to switch your current maintenance licenses to a subscription model plan. Transitioning to subscription will save your organization money over time, and give you access to Autodesk’s ongoing stream of innovation, updates to core products, and cloud services. For more information, contact your account representative today, or contact us here.